4T - $96.99 Only 1 left! Be glad that your little one takes after her mother when you outfit her with this Vampiress costume. Sure, her dad is a great man, but when it comes to Vampire business, no one takes care of the family quite like Momma! With your little girl in tow, your family is going to be the most respected group of Transylvanians that anyone's ever laid eyes on. This cute and classic look is the perfect way to get her involved in the vampire action! 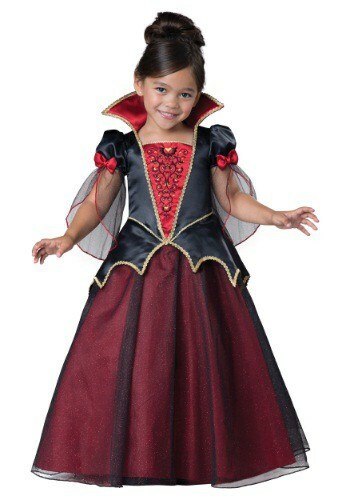 Your little toddler will look so sophisticated in our ball gown style Vampiress dress, with beautiful deep red colors, perfect for a career in blood sucking, you won’t believe how grown up she looks, pause for that sad parental moment. With a sheer glitter overlay and a tulle petticoat she will sparkle and shine as she dances through the streets in search of all the candy she can get her fangs on! Make it a family affair true vampire fashion and dress up your entire family in our wide variety of blood sucking inspired costumes. Don’t forget the theatrical blood and vampire fangs for your little creature of the night! She’s going to need them to start her official vampire training, she will be unstoppable once she masters all of her vampy tricks! Make sure to hide all of that garlic and silver, you’ll want nothing to get in her way while she’s on the hunt!